It is a paradox in Great Lakes history that one of the first major disasters involving a fire at sea happened to the propeller Phoenix in 1847. The vessel was named for a mythological bird of ancient Egypt that was said to have perished in flames, then rose fresh and young from the ashes. But this Phoenix, which burned near Sheboygan, Wisconsin, on Nov. 21 taking an estimated 200 passengers to their death, never came back. It burned to a ruined charred hulk that was never rebuilt. The Phoenix was among the first twin-screw propeller driven vessels to enter the lakes. The first of these new vessels, the Vandalia, appeared only two years earlier and in its day was considered a radical change from the side wheeled steamers. 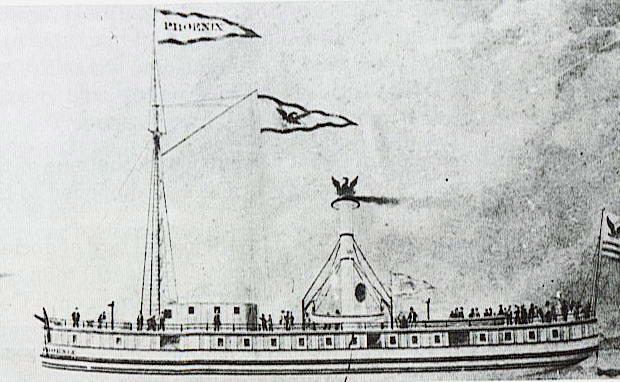 Built in Buffalo in 1846, the Phoenix was considered a large ship in its time although at 140 feet it would be considered a midget by today’s standards. Designed as both a passenger and package freight carrier, the vessel was engaged by the Pease & Allen Co. of Cleveland in carrying immigrants from Europe who were traveling west from Buffalo to Chicago by way of the Great Lakes steamships. The human traffic was especially heavy in 1847 because of a reform religious movement sweeping through Europe. As the Reform movement reached Holland, the Dutch State Church began clamping down, driving many of the new reformers out of the country. They fled to America by the thousands. The Phoenix, with Capt. Bensley G. Sweet at the helm, left Buffalo on Nov. 11 on what was to be her final scheduled trip of the season. She was carrying a cargo of coffee, molasses, hardware and chains. She also was carrying an estimated 300 passengers, most of the Dutch immigrants on their way to new homes in the Midwest. Sadly, the Phoenix was never designed to carry so many passengers. Only 25 passengers enjoyed cabin space. The rest were crammed anywhere they could find room. With winter winds already blowing cold across the open waters of the lakes it was a long and uncomfortable trip. Ten days later, while on the final leg of the trip steaming south along the Wisconsin shore, disaster struck. It was at about 4 a.m. when a fireman in the engine room noticed flames on the underside of the deck directly over one of the boilers. At about the same time, flames were noticed coming out of the ventilators used for moving hot air from the engine room. M. W. House, the chief engineer, organized a fire-fighting effort, establishing a bucket brigade utilizing not only crew members but passengers. They were unsuccessful in getting the fire under control and it quickly spread throughout the wooden vessel. By now the ship was standing dead in the water as the bucket brigade worked feverishly to battle flames that threatened not only the ship, but the lives of everyone aboard. Passengers panicked. Many jumped overboard to drown in the cold waters of Lake Michigan. There were only two lifeboats on the Phoenix and both were launched. Captain Sweet manned one of them and the first mate left on the other, with an estimated 50-60 survivors packed in them. The rest of the crew and passengers were left by the chief officers to their fate on the burning ship. The ship’s purser and Engineer House survived by climbing over the side and hanging on the anchor chain until they were picked up by the steamer Delaware. The Delaware arrived too late to save any of the people on the burning ship but pulled three survivors, still alive, from the water.